This Bookreporter.com Special Newsletter spotlights a book that we know people will be talking about this spring. 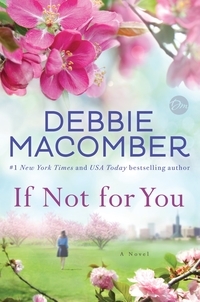 Read more about it, and enter our Spring Preview Contest by Friday, March 24th at 11:59am ET for a chance to win one of five copies of IF NOT FOR YOU by Debbie Macomber, which is now available. Please note that each contest is only open for 24 hours, so you will need to act quickly! #1 New York Times bestselling author Debbie Macomber has written an emotionally stirring novel that shows how sometimes a choice can seem wrong even though it’s absolutely right. If not for her loving but controlling parents, Beth Prudhomme might never have taken charge of her life and moved from her native Chicago to Portland, Oregon, where she’s reconnected with her spirited Aunt Sunshine and found a job as a high school music teacher. If not for her friend Nichole, Beth would never have met Sam Carney, although first impressions have left Beth with serious doubts. Sam is everything Beth is not --- and her parents’ worst nightmare: a tattooed auto mechanic who’s rough around the edges. Reserved and smart as a whip, Beth isn’t exactly Sam’s usual beer-drinking, pool-playing type of woman, either. But if not for an awkward setup one evening, Beth might never have left early and been involved in a car crash. And if not for Sam --- who witnessed the terrifying ordeal, rushed to her aid, and stayed with her until help arrived --- Beth might have been all alone, or worse. Yet as events play out, Sam feels compelled to check on Beth almost daily at the hospital --- even bringing his guitar to play songs to lift her spirits. Soon their unlikely friendship evolves into an intense attraction that surprises them both. Be sure to read our review of IF NOT FOR YOU in the March 31st Bookreporter.com Weekly Update newsletter. - Visit Debbie Macomber's website, Pinterest, Instagram and YouTube channel. - Connect with Debbie Macomber on Facebook and Twitter.